If you are looking for an alternative to wall mounting your flat panel TV, the asymmetric design of the Hollywood and Dolce Vita stands from Cattelan Italia are one stylish (but expensive) option. The Hollywood unit can accommodate flat-panel LCD or Plasma televisions up to 42" wide while the Dolce Vita handles smaller sets up to 32". 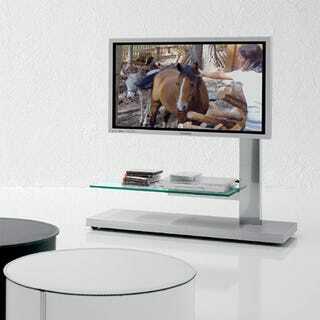 Both are vertically adjustable, so you can achieve the height that is most suitable for viewing. In addition to the glass shelving, the Hollywood also features a stainless steel CD storage unit mounted behind the television.